I am excited to share this unique birth story. When I read it I wasn't quite sure if this was an unassisted birth or what was going on so, I e-mailed the mother. As it turned out, the mother lives in a state (Ohio) where home birth midwifery is not licensed but also not illegal. She was attended by an unlicensed midwife, who she referrers to as a friend. There are those who believe that home birth is unsafe. Some believe that licensing makes it safer. Others believe that this places undue regulations on the midwife and limits her ability to attend some women. I don't know the answer to this question, but this birth story is more than a birth story. It is an exploration of how midwifery and home births play out when state regulated licenses are not a part of the equation. 3) Some women birth with midwives who are not legal and/or licensed, and so cannot carry with them lifesaving drugs (such as anti-hemorrhage drugs) that midwives in other states can legally carry. As the mother in this story stated to me, "This is a huge disservice to parents." The other thing I love about this story is that even though mom had complications after the birth, she was able to safely transfer to the hospital to get the interventions that she NEEDED. Not only that, she was treated well by the staff. Now that is how home birth and hospitals can work together. I was due on November 9th, and even though both Julian and Melody had carried very late I thought that this one would come sooner. I felt so much more "pre-labor" than I ever had before, and I was sure that that meant I would be having the baby on time, if not early. A week or two before I was due I had a strong contraction that seemed to last an hour. It hit me while I was making breakfast. It rendered me frozen in place, and seemed to lessen on occasion to allow me to change position, pour a glass of milk for the kids, sit on the couch, and then it would start up again. It never completely went away during that time, and it was very painful, lasting for close to an hour before subsiding all together. I was so excited - I was sure labor was starting. 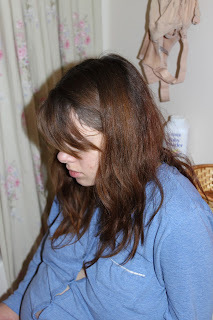 I had never had contractions without being in labor before. But after that hour it was over, and contractions didn't pick up again for about two more weeks. Once they did they were painless tightening sensations that came and went whenever they pleased, keeping to no rhythm whatsoever. Two weeks of those erratic contractions were making me crazy, and since my mom was only in town for a few weeks we were all growing concerned that she would miss the birth. During the pregnancy I was told a few times that the baby was posterior, so I can only guess that my two weeks of painless contractions were simply getting the baby into a better position for labor to actually start and go smoothly. At 41 weeks I began losing my mucous plug, which I thought was a sign that labor would be starting very soon, as it had with Melody's labor. But, to my great disappointment, I lost little bits of it for another week before anything happened. I tried to keep reminding myself that my body worked - it had birthed before and it would do it again. God's timing was perfect, and He was in control. But I think that birth is such a crazy, miraculous thing that I'll never be able to fully grasp, and it was hard to let go and completely surrender no matter how hard I tried. I was very impatient, and not only did I not want to be pregnant anymore, but I wanted the baby to come so that I could be assured, once again, that it would all work out and my body really did know what it was doing. On Tuesday, November 23rd, I was at Chick-Fil-A with the kids for a playgroup with our La Leche League friends. At about 11 am I had another very painful contraction that grabbed a hold of me and didn't let go for a number of minutes. I had stood up to go to the bathroom and was frozen in place. I started to panic inside, because I was in so much pain and I thought it may be because I had to empty my bladder, but I knew that there was no way I could make it to the bathroom. After a few minutes it lessened, but it didn't release completely for a while longer. For the rest of the day I had the same painless contractions I had been having before, however this time they were regular. They stayed around 10 minutes apart all day long. But by midnight when they hadn't amounted to anything else, I went to be disappointed. I was now 42 weeks and 2 days pregnant. At 1:15 am I awoke to a strong, painful contraction. They continued and stayed painful and 5 minutes apart for the next 25 minutes, so I then called my friend. I still wasn't sure if this was the real deal, since I had been let down so much before. But they were strong and regular, so I told her she could come over now. Dominic, my mom, and my older sister were here with me. My friend arrived and called a couple of other friends to join us. I spent the next couple of hours on my bed, moaning and swaying with my pillow. I tried to escape the contractions, but I couldn't. In my labor with Melody I vocalized the entire 9 hours. I yelled "ooooh" with every contraction. It seemed to help me cope - it was like I was yelling at my contractions, keeping them in check. At the end, during transition, vocalizing was all I could do to keep from feeling like I was just going to fall apart. This time, though, vocalizing didn't help much at all. I tried it a bit, but it seemed to almost annoy me more than anything else, so I stopped. When I stopped Dominic was worried that the contractions had lessened, but they definitely hadn't! With each contraction I remember rocking or swaying my head from side to side with my eyes closed, trying to run away in my mind. I held my pillow, and sometimes laid on it, but I didn't get off of my bed the entire time. My friends and family came upstairs to check on my occasionally, but mostly stayed downstairs. I was so tired, and that made the whole thing harder because I just wanted to go to sleep. I wanted to push the pause button and rest! At one point my friend, Dominic, my mom and sister were all in the room with me, and my friend was talking about something to them while I was having a contraction. I yelled at them to "Be quiet!!" And then I mumbled "just when I'm having a contraction...". I had to focus only on my body, and outside noise was adding stress. 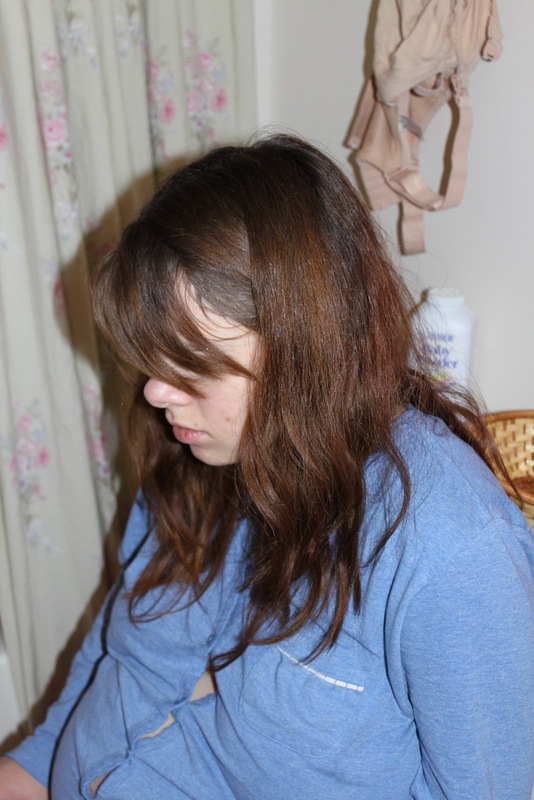 The contractions were getting slightly more intense and I was feeling a lot of pressure. I remember thinking that my water was going to break at any second because the pressure was so strong, and I felt a little fear that there was nothing I could do to stop it. It was happening and I was out of control. Around 4 am a friend and Dominic were in the room with me, and my friend suggested that I try to go pee. I did NOT want to get up! Dominic asked if he could go downstairs and get a snack (he hadn't left my side the whole time), and we said yes, so he did. All of a sudden I had a third strong contraction that didn't come and go like normal - it was sharp and didn't let up. I was standing by my bed frozen in pain; I felt stuck again. The baby was also moving during the contraction, which is something I'd never felt before and something I never want to feel again! His movement brought a whole new element of pain to the contraction. I was standing by the bed, whining at my friend that I couldn't move, and I didn't know what to do! It lessened after a few minutes and I made my way to the toilet. I can't remember if I peed or not, but I quickly had another contraction and my body started pushing. Not me, my body. It is so strange to have your body do something that you can't control. With that push my water broke and I yelled out in fear and excitement. It sort of exploded, just like it had with Melody. I knew the baby would be out any minute. Dominic says he heard me yell and ran upstairs, never getting to eat his rice ;) Everyone else ran upstairs, too, and grabbed all the cameras and met me in the bathroom. Luckily we have a big bathroom! Altogether there were 7 of us in there. My friend said that the water was clear, but later told me that there was meconium in the water but she had said it was clear so as not to worry me. 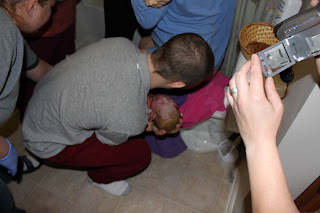 I began to panic - the baby was coming, and I knew there was no way I could get off of the toilet in time! I was sure I'd push the baby out in to the toilet and then we'd have to get it out somehow, but I didn't know how! Watching the video I looked fairly calm, but inside I remember distinctly panicking about having the baby in the toilet. My mom asked me if I wanted to get up and I told her to "carry me". Ha! I'm 10 months pregnant, but please just lift me up and carry me to the bed! I put all my weight on her and my friend, and they did their best to lift me to a standing position in front of the toilet. I felt the next contraction, I felt my body pushing and I felt the baby coming down. 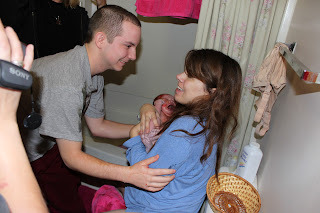 Even though Melody's birth was unmedicated, I don't remember feeling the same sensations that I felt this time. I could feel him coming down the canal - I remember feeling his nose inside me. The only words I uttered were "Baby. Baby." This was my warning to Dominic to catch the baby! I felt him emerge, his head and then after just a moment the rest of him shot out. It was all in one contraction. And he really did shoot out - just like Melody. Apparently that's how I have them ;) And to think, I pushed Julian for an hour! Dominic had to move fast to catch him, and because of my position he almost hit the back of the toilet! Dominic is a pro baby catcher now :) It was 4:14 am. After I knew the baby was out I think I said something like "Thank God". The whole time I was in so much pain, I was so tired, and I was sure I couldn't do it. It is the highest mountain I will ever climb. It is the most terrifying and exciting thing anyone can ever go through. And I knew I couldn't do it. Most women either catch their babies themselves or quickly take them and hold them. I didn't with Melody , and I didn't with Adrian. Both times I didn't even look at them for a few moments, I was too busy sort of regrouping myself. I had both of them standing up, so I stayed in my position and cried for a moment. I was so overwhelmed with relief and amazement that I couldn't even look yet. Adrian started crying soon and cried a LOT. Melody had been so peaceful, but this one was angry! I finally sat down and Dominic sort of weaved the cord through my legs so I could hold him. He looked just like Julian. I looked and saw that he was a boy (I had told no one to say the gender until I saw for myself). I felt very good. Very healthy and alert. Not in much pain. I sat on the toilet and held him for a long time. After about 5 or 10 minutes my body started pushing with another contraction and I knew that the placenta was coming, so my friend quickly lifted the toilet seat and put in the sitz bath so I could push it out right into there. Very convenient! Someone woke up Julian and Melody and brought them in. Melody was very tired and took a few minutes to register any interest in the baby, but once she did she poked him in the eye repeatedly and said "Baby's eye!" Julian was excited from the start, but sad that he had missed the birth, and informed us that we should name him Joseph. After a little while they helped me walk back to the bed, and when I reached the bed I felt a gush of blood flow out. I got into bed and laid there for the next couple of hours with Adrian (whose name we hadn't decided on yet). My mom cut his very long cord after it had turned completely white and stopped pulsing. He weighed 8 pounds and eleven ounces. I nursed him and held him and felt great. However, I was losing a little gush of blood with each contraction. My uterus was clamping down and hardening well, but the blood loss was a little worrisome 2 hours later. Also, while looking at my placenta, it was breaking apart just from our touch and we couldn't tell if all the pieces were out of not. This was definitely an old placenta that was at the end of its life. I didn't feel bad, though, until I tried to sit up and I got very light headed and had to lay back down again. My friend strongly suggested I call the midwife on base who had been seeing me during the pregnancy because of my history of anemia and my previous retained placenta and D & C.
I really didn't want to. I didn't want to go in to the hospital and ruin my whole experience if I didn't really have to. When I did call the midwife, she advised me to come in and see the OB on call (it was the day before Thanksgiving and the clinics were all closed, so she wouldn't be coming in). I really didn't want to, so I put it off a little longer. My friend made me a placenta smoothie (a quarter-size piece of the placenta in a strawberry smoothie to help stop bleeding and expel any retained placenta and clots. It was actually good - I couldn't taste the placenta. But it was a huge mental obstacle to get myself to drink it without gagging, just thinking about what it was). I finally agreed to go to the hospital, and when I stood up I completely passed out. I was out for about 10 seconds, and when I came to my friend was calling out orders. I remember her telling someone to find me a sweater, and Dominic yelling that he didn't have any shoes! Everything was fuzzy as my friend and Dominic carried me downstairs. As soon as they opened the door, though, the cold air hit me and I was immediately awake. I felt great! But I was still losing blood as we walked. I was only wearing a sweatshirt - nothing else! They had my bottom half wrapped in a blanket. I wasn't even wearing socks or shoes! We left the baby with all of those at the house, since the car seat wasn't installed yet. When we got to the emergency room they brought me to labor and delivery, where the on-call OB was expecting me. We explained what had happened. He was very nice, but forceful, and the things he did to me were excruciating. It was worse than labor and birth put together. He did bi-manual massage, with one hand inside me messing with my cervix, and the other hand on the outside of my uterus, pressing and squeezing to remove all the blood clots. It was awful. Many clots came out, though. After a few minutes he did it again, and in that short time my body had accumulated the same number of clots, so they gave me a shot of methergine. The nurse was very nice. Her name was Julie. I'll never forget how wonderful and kind she was that whole day. She laughed at me when she gave me the shot, because I was such a baby about it. She said "You just had a baby at home and you're worried about a shot?!?" But the shot really hurt! I am a baby ;) The methergine didn't stop the bleeding and clotting so he did an ultrasound to check for retained placenta, and he found some. There was a piece still in that had adhered to the scar from my previous D&C. I was heartbroken. This meant I would need another D&C. But they got me in for surgery within the hour. A friend who had missed the birth but had come over afterwards to help clean up stopped by and brought Adrian so that he could nurse before I had surgery. Then he stayed with Dominic. After surgery I felt good, although my throat was very sore and scratchy from the intubation, and I was still lightheaded when I got up. They were going to keep me overnight, but luckily the doctor that came on for the night shift seemed to want to get rid of me and let me go home that night. I recovered like normal. I had a tear that I never noticed after the OB pointed it out, and it didn't cause me any pain. It healed on its own. We decided on Adrian's name that first day in the hospital. He has been healthy and a wonderful nurser these last 5 and a half weeks. I can never fully express my gratitude to my wonderful friends and family who came and encouraged me during labor, photographed the birth, cleaned my bathroom and bedroom spotless after the birth, stayed with me for hours in the hospital and brought me Adrian. They are truly wonderful, and I can't imagine birthing without such a wonderful support system. I don't know why I had retained placenta with Melody, and again this time. I don't know why I am severely anemic when pregnant. I don't know why my placentas break down and my body doesn't begin labor earlier. But once again, overcoming all those obstacles, I do know that my body is not a lemon. 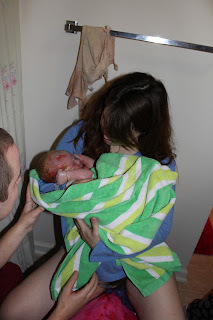 It labors and births babies perfectly, and I am so grateful to have gotten to experience 2 wonderful home births. We are not planning on having any more babies, but if for some reason we did, given my history with bleeding problems, placenta retention, and scarring, I would still labor and birth at home and go to the hospital afterwards if necessary. Home birth is the right option for me. I know it isn't the right option for every woman, but I do wish that if anything I could just encourage other women to have faith in their bodies. To trust their inherent ability to birth. I am a wimp. If I can handle labor and birth, anyone can! surrounded by love, safety, and warmth. Loved reading this. I just moved to Ohio and will be planning my own homebirth with an "unlicensed" midwife hopefully within the coming year. It's a little daunting coming from Seattle where homebirth is no big deal and midwives are protected and supported. But I know that I have a great option. Thanks for sharing your story! @Cassie, the answer to your question is yes, no, and sometimes. It is up to parents to find the education and experience of the midwife they choose to hire. Also, we do have CPMs in Ohio, they just are not licenced and regulated by the state. While homebirth midwives in Ohio are not CNM most are very well educated and experienced. Homebirth parents really depend on networking with other homebirth parents to insure they choose well qualified providers. Btw, this is good advice for anyone choosing any care provider anywhere. A license and a certificate does not mean they are good at what they do, it just means they took classes and passed tests.